Finding and retaining top leadership and board talent can be a strategic game changer. We understand that conducting a retained search which produces a great result and delivers sustained value requires more than sector experience and a cursory review of critical success factors within a client system. In an industry that hasn’t innovated in a hundred years, we’ve been in relentless pursuit of “doing it better” since our beginning. We practice retained search as it was originally intended; as a specialized form of management consulting, not a transactional exercise of filling seats in a vacuum. 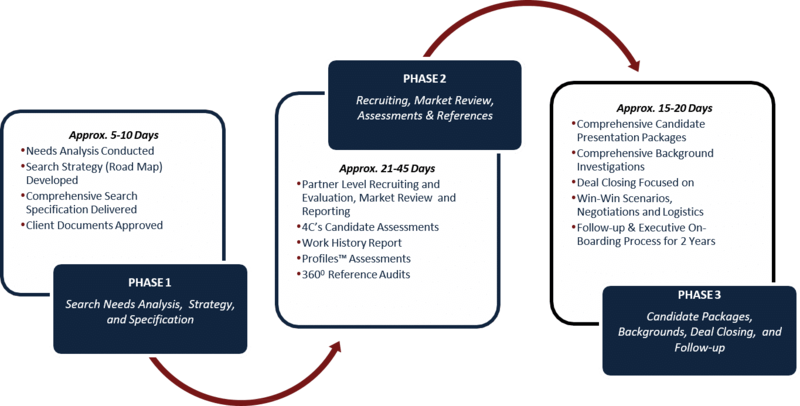 Our proprietary Foresight™ process is an evidence-based search methodology designed to ensure the best possible match, resulting in 97% offer acceptance, 92% retention at the two-year mark, and significantly higher engagement levels. Our clients rely on us as trusted advisors, to assist them in determining exactly who and what they are looking for, and why. As a leader in retained search services, we provide the optimal search strategy, fully transparent reporting, candor even when it is not convenient, due diligence at the highest levels, an unprecedented guarantee, and aftercare past the point of placement.